Email is the unsung hero of user engagement. While Snapchat and Yo! may be fun and flashy, 77% of consumers still prefer to receive marketing messages via email, and no other channel even comes close. People use email addresses as an extension of their identity and for daily communication. They also use it for registering for new websites, apps and online stores. No wonder it’s also the marketing channel with the highest ROI! Email can be used to increase user engagement at every life stage –whether a user is new, regular or dormant. Here are three truly great email strategies. I’ve learned these from my previous position as a growth engineer at Twitter and from working closely with my current Iterable customers. They are easy to set up with Segment and are highly rewarding, in terms of both ROI and engagement. Justin Zhu is the CEO of Iterable. Congratulations on your recent funding round! Your Adwords campaigns, SEO efforts and TechCrunch article placement have helped to spread the word about your company. Congratulations, you conquered the “awareness” hurdle and users are lining up for your product! How do you keep these new users engaged during their early days and convert them into a loyal lifetime user? The key tool is the onboarding email series, which will educate new users and encourage them to complete certain desired actions. To create this workflow, first consider what a user must do in order to “get hooked” on your product. At Twitter, the necessary user actions include following other prominent Tweeters, downloading the mobile app and finding friends on Twitter to achieve mutual follows. 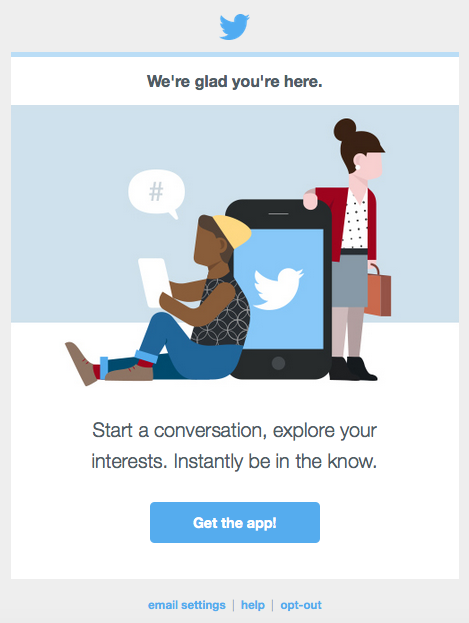 Subject: Welcome to Twitter, firstName lastName! This email was sent immediately after sign-up to all users. This email was sent four days after sign-up to all users. Subject: firstName lastName, find your friends on Twitter! 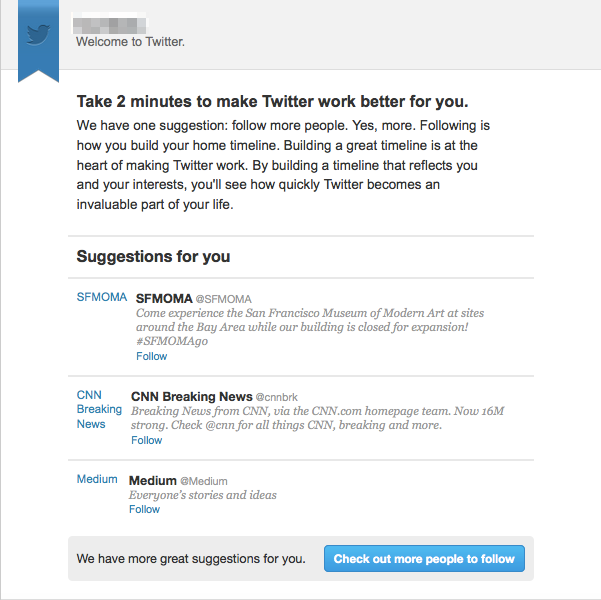 This email was sent every 4-7 days after sign-up to all users until they reached a certain number of mutual follows. Trigger when a Signed Up event is tracked, and send welcome email immediately. Check to see if the first desired action (made a purchase, entered credit card info, uploaded profile pic) has been completed. If desired action has not been completed, send the first action reminder email. It may also help to add an incentive for performing an action. For example, if you’re trying to encourage a purchase, offering a promo code can help! If desired action has been completed, move user to the next email in the series. Repeat steps 3-5 for each desired action. Remove user from new users list and integrate them into your normal email communications. Welcome emails have very high engagement rates since right after signup, your app or online store is at the users’ top of mind. Typically, we’re seeing open rates of 30-40% for apps and 20-30% for ecommerce companies. Imagine the last time you shopped online, found a product you liked, and added it to your cart with the full intention of buying. Suddenly, something comes up. Your cat pees on the bed, grandma calls, Justin Bieber releases a new album, and you’re off! This unfortunate cart abandonment happens all the time. But all that is required to bring shoppers back to complete the purchase is a simple reminder. According to a MarketingSherpa survey of over 2000 Americans, 51% of people who ever left an item in an online shopping cart find reminder emails helpful with 6% saying they always complete the purchase after receiving the message. 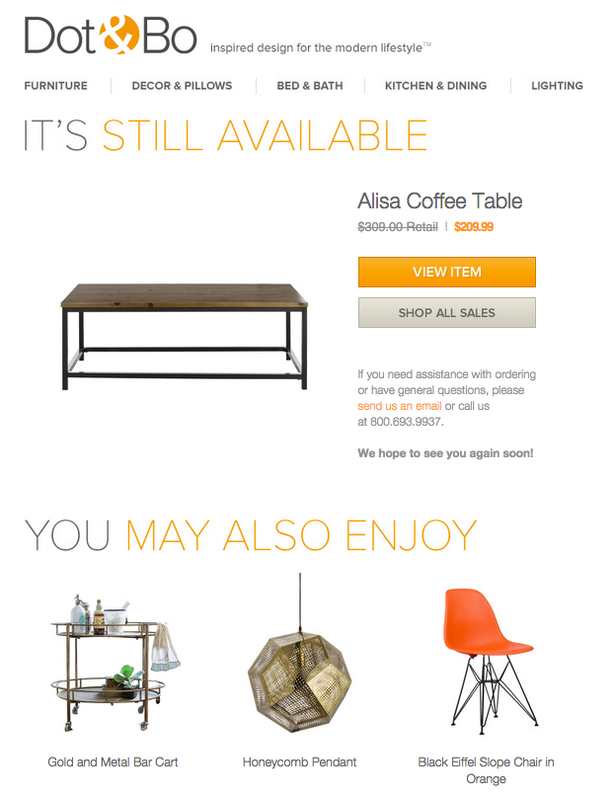 Creating a cart reminder email can be done using Segment’s ecommerce API to send cart events. User enters the workflow when the Added Item to Cart event is tracked. Wait 1-3 hours depending on the average shopping time on your website. Check if user has completed purchase. If not, send abandoned cart email with preview of items in cart and link to check out. 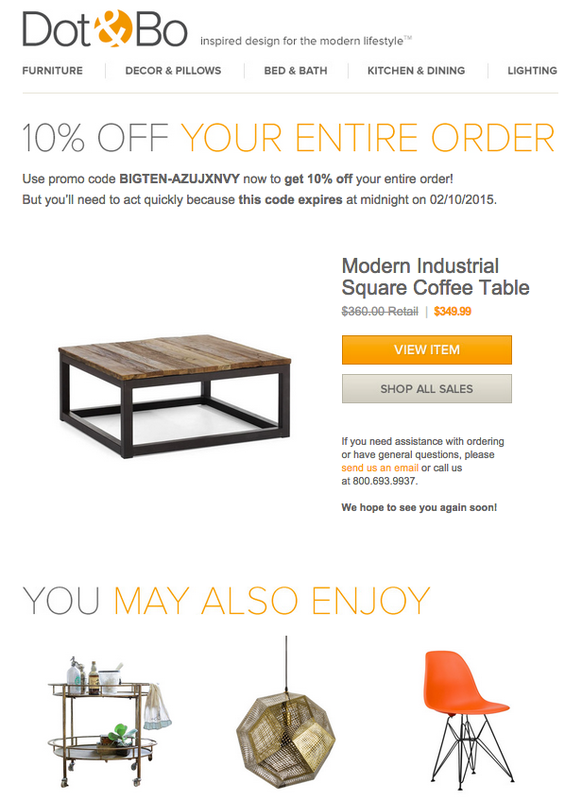 Send second email, possibly with a discount offer if cart value exceeds certain amount. Our ecommerce clients see open rates between 30-50% for their cart abandonment emails, and revenue per email is between $1-$3. Adding the second or third email can be quite effective as Dot & Bo saw a 400x increase in campaign revenue with a two-step abandoned cart workflow. You’ve onboarded the user and reminded them to complete their purchase. Hurray, they bought your super awesome fluffy inflatable noodle stick. What’s next? Either they’re a massive fan and purchases again every week or more likely, they’ll fall off the grid within a few months. Dear customer, we miss you! To bring them back, implement the re-engagement email campaign. Trigger when 30 days has passed since last purchase or app open. Send email with latest content or re-engagement offer (coupon code, items, new features). If email is not opened, send another email or push notification. The re-engagement campaign invites dormant users to come back and rediscover why they fell in love with your product or store. On average, we see open rates of 25-35% e-commerce companies. Hopefully you were able to see the immense value of email in this post. If you’re looking for a powerful email automation solution for creating an onboarding, cart abandonment or re-engagement campaign, I invite you to check out Iterable. If you are already on Segment, sending user data and events to Iterable is as easy as flipping a switch. Iterable is an all-in-one email platform for growth hacking the inbox. The solution covers 100% of your email needs by sending triggered, promo and drip campaign emails. Iterable also includes a plethora of built-in tools like dynamic segmentation, mobile previews and A/B testing to make sure every single email campaign is fully optimized.